Calicut New Media » City Talk » How did Calicut city celebrate New Year Eve? 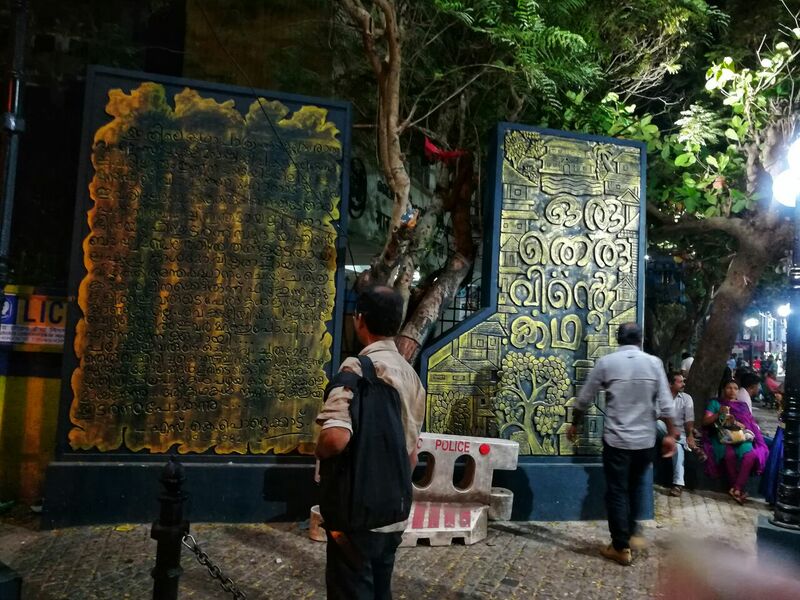 CNM tries to find out Calicut’s real self on new year’s eve. 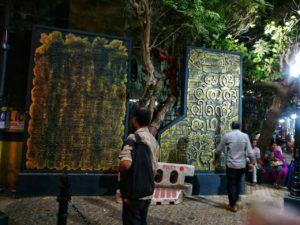 How did Calicut city celebrate New Year Eve?What was special this time? Beach trip was always there.Fun,music,bike riding with friends and loved ones,bands and fire-crackers were also there.However,this time the city witnessed a special charming new year eve at modified SM street.Lights and camera were always on towards the new dawn of Jnauary 1,2018. People’s hangouts during the celebrating new year eve ,police vigilance through out the city pockets,people trying to find out a shelter at footpaths even amid the celebrating moments…. Television journalists from different media groups try to find out best shots at SM Street.City folks and guests who reached in the city to shop and enjoy a new year experience, here wish ‘Happy New Year ‘ in front of TV cameras.Some explain the new charm that brought in the street as the result of recent beautification by the district administration. 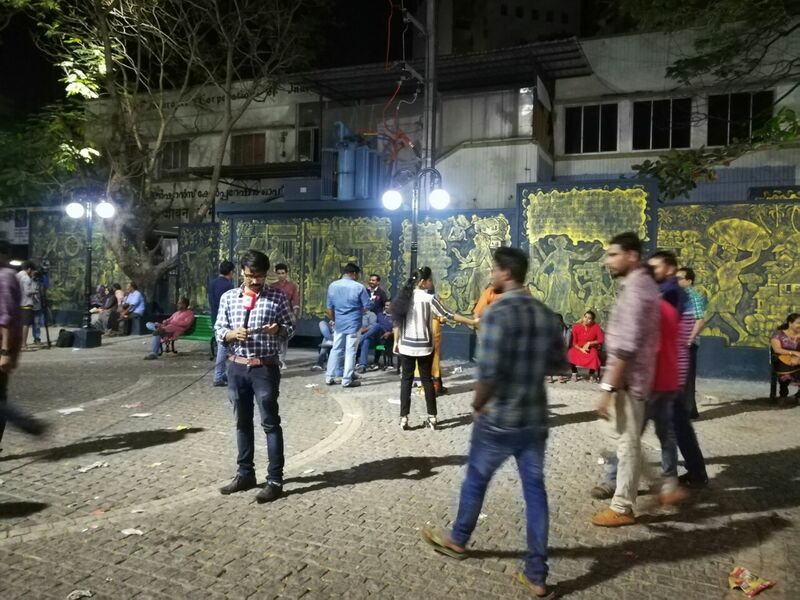 Youth’s get together was peaceful,there?A well-disciplined ,cultured corner was created at SM street entry near SK Pottekkat statue. When clock ticks to midnight,the presence of women and children,excited to give a warm welcome to new year,it was a special feel on the face of Calicut fans. ‘Do you feel something different at this street?’.This was the question shared among friends who visit this spot for every special occasion and routine shopping. It was a changing trend in the city of truth. Some of the media friends who take SM street visitors bite express their own perspective on the new looks of the historical city. “A cultural up-rise is very near,if Kozhikode gets all support from people,leaders and the government.”,Vinod KP,one of the visitors said. People,including women sit in relaxed mood,without any anxiety of safety issues. Good light system is the best part of the safety sign, here.Anti-social elements are blocked with local people and police support. “I wish every night is beautiful as this.”-Prerana Pramod,a girl from Nadakkavu. However,she raises her concern about the waste management. Some visitors are least bothered about the proper waste management. 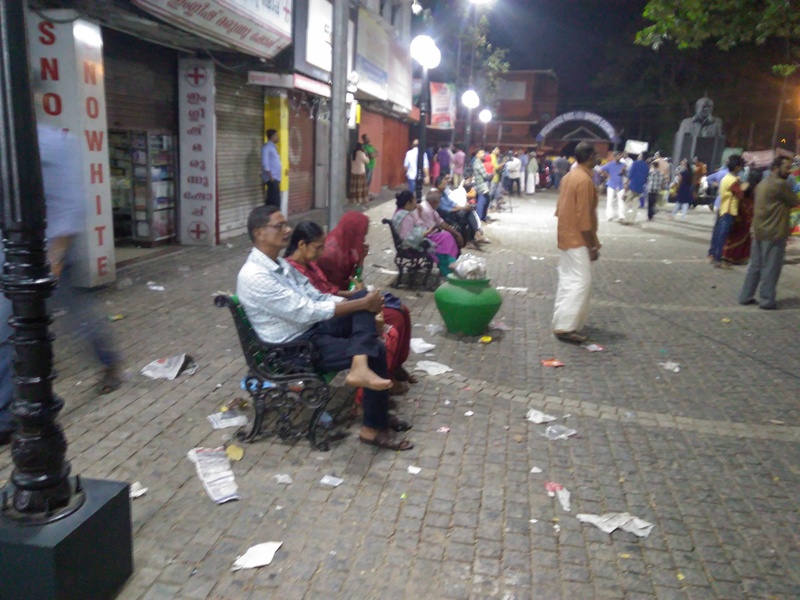 Even if ,dust bins are provided near by seating, paper wastes are spread over the spot to ruin the neat appearance of the new looking street. When we reached KSRTC busstand,it looks illuminated,showing the festive sign.But,outside the bus stand,police on duty was hectic to catch pick-pockets and anti-social elements just opposite to the bus stand. In the new bus stand area,there were a group of people,possibly from neighboring states were trying to find a shelter on footpath.However,duty police officers asked them to leave the footpath and warned it was not the space for sleeping. The less-privileged group has been always there in the city life. This News was posted on Monday, January 1st, 2018 at 6:23 am and is filed under City Talk.